Eight more athletes scored places on the Japanese team for August's Beijing World Championships on the last day of the National Track and Field Championships, and despite high winds and rain three records fell. Satoshi Hatase (Gunma Alsok) set a men's shot put national record of 18.78 m, Ryohei Arai (Suzuki Hamamatsu AC) following him with a meet record 84.13 m throw in the men's javelin that secured his place in Beijing. Women's 3000 mSC junior national record holder Anju Takamizawa (Matsuyama Univ.) took more than 5 seconds off her own record with a new junior NR of 9:55.79 for the win. Both the women's and men's 5000 m featured great races. In the women's 5000, 2-time defending national champion Misaki Onishi (Team Sekisui Kagaku) showed some uppage in her game by running down talented new young gun Azusa Sumi (Team Univ. Ent.) and #1-ranked Ayuko Suzuki (Japan Post) for the win in 15:18.77, earning her Beijing spot in the process. Sumi, who came back at the bell from falling off Onishi's attack, came up just short of the Beijing standard with a 15:21.07 PB for 2nd, Suzuki holding off Onishi's teammate Riko Matsuzaki (Team Sekisui Kagaku) for 3rd in 15:24.14. Sumi will have to try to run the standard before Aug. 2, but Suzuki is a safe bet to be added alongside Onishi thanks to a 15:14.96 PB earlier this season. With a 4th-place finish Matsuzaki will be staying home despite having run a qualifying time. In the men's 5000 m Kota Murayama (Team Asahi Kasei), the only Japanese man to have broken the 13:23.00 Beijing standard so far, outkicked Suguru Osako (Oregon Project) in the last 100 m for the win in 13:37.22, a virtual replay of Osako's multiple losses to Yuki Sato (Team Nissin Shokuhin) in the 10000 m the last few years. With a half dozen people taking turns at the lead up front Osako never engaged, sitting about a third of the way back in the field throughout the race before trying to kick away on the last lap. Murayama, who holds better 1500 m and 5000 m PBs than Osako, went right with him and put enough ground between them to give the crowd a #1 sign well before the line. 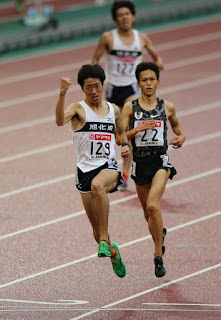 Murayama will go on to Beijing, but Osako will still have to run a standard time if he hopes to join him. 3rd-placer Kazuya Deguchi (Team Asahi Kasei) ran just off his PB, outkicking Hiroyuki Ono (Team Nissin Shokuhin) and 10000 m champion Tetsuya Yoroizaka (Team Asahi Kasei) to round out the podium in 13:39.52. Also guaranteeing themselves places in Beijing were men's 800 m winner Sho Kawamoto (Suzuki Hamamatsu AC), men's 400 m winner Yuzo Kanemaru (Team Otsuka) who barely survived a challenge from relative unknown Kentaro Sato (Josai Univ.) after having almost run a PB in the heats, men's long jump winner Yohei Sugai (Mizuno) and men's and women's 100 m champions Chisato Fukushima (Hokkaido Hi-Tec AC) and Kei Takase (Team Fujitsu). After running big in the 200 m, 16-year-old Abdul Hakim Sani Brown (Josai Prep H.S.) did it again in the 100 m, taking 2nd in 10.40. Look for more from him in a few weeks at the World Youth Championships.